Start Them on Technology Young. Really Young. I’ve been working on a set of guidelines for the intentional and appropriate use of new media in various types of storytimes: babies, toddlers, preschoolers & mixed age or family storytimes. 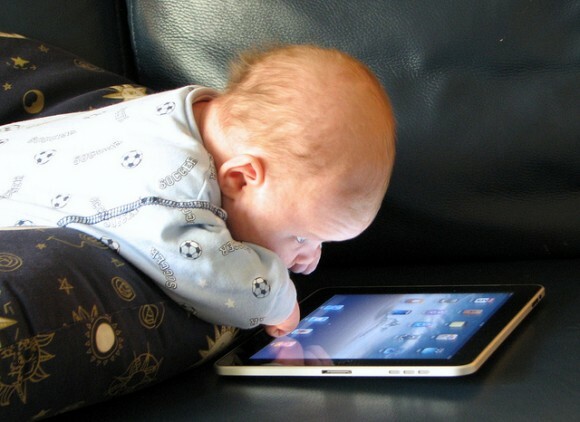 There has been a lot of discussion on my team about how to follow the guidelines of the AAP (discourage media use for children under the age of 2) while still keeping in mind some of the actual uses of technology that we see everyday, like babies in strollers holding iPads instead of looking at the world around them. We have to start them on technology young. Really young. So who is “them”? No, not the babies, or even the toddlers. They don’t NEED technology; it’s perfectly debatable that preschoolers don’t either. But their caregivers need to be thinking about what kind of media consumption is acceptable for their family when their child is still very young, because much to our chagrin, very young children are exposed to media every day. How can librarians help? At LittleeLit we’ve been experimenting with technology that is still embryonic and frankly, sometimes clunky (AppleTV connectivity malfunction much?!) We’ve been trying out different types of media in every kind of storytime program, including baby storytimes (usually only with resources slides, book covers, call numbers, lyrics, parent tips etc). Just like how we say “it’s never too early to start!” about reading, it’s never too early to start talking to parents about the implications of media use with young children, and about how they can decide what they want their family media use plan to look like. Posted on May 31, 2014, in Literacy. Bookmark the permalink. 1 Comment. Thank you for this post, your careful thought, and the efforts you continue to make to figure out what advice is best for parents. I am concerned with how much media/electronic use is taking attention away from reading. I do think that parents (and teachers, librarians, pediatricians…)should be making real, conscious and informed decisions on how much and in what ways they utilize technology in their household. I look forward to more discussions about this!